It is my pleasure to reveal the awesome cover of Ronel van Tonder’s new book. In a world where arrogant leaders force-feed their supplicants with lies and abuse, freedom is an illusion. This terrifying future, that harbours such insidious undertones, turns hope into a darker shade of despair. But there will be a reckoning. 16 March 2036: Black Sunday. For 24 hours, solar storms ravage the world. Earth is plunged into darkness. Our way of life is destroyed. But mankind conquers this apocalypse. Domes are erected to shield a percentage of earth’s population from the devastating radiation. Nothing gets in. And no one gets out. But, in a world where money no longer exists and denizens have everything they need, freedom can become… subjective. Black Sunday refugees, those that didn’t make it into the domes, survive by digging extensive underground housing networks. These diggers remain paralysed by need, scratching an existence from the sun-scorched savannas above their colonies. Now, three hundred years later, only a handful of unscrupulous individuals from each half of this discordant world still have knowledge of their opposing sides. Peppermint lives a shameless life filled to the brim with hedonistic pleasures. And is completely unaware of the bloodbath planned for mankind. When she discovers she’s a psi, with the ability to see into the future or the past, her world collapses. Can Peppermint ever hope to control her powers and regain her freedom? Or is she destined to spend her life as a slave of the elite? Jinx, a brazen and volatile soldier, is on the hunt for revenge. The search for her mother’s killer lands her in the center of a rival digger colony. But can she withstand the shocking revelation her hunt reveals? Or have her mistakes plunged her into a depraved nightmare she doesn’t have the courage to escape? And while both women struggle with their new realities, a conspiracy centuries in the making is nearing its climax. Can Peppermint and Jinx remain true to themselves while taking a stand for our most valued human right? Or is freedom as unattainable as truth? COMPILE:QUEST is a feast of intrigue, conspiracies, and suspense – guaranteed to have you on the edge of your seat from the first chapter to the last. This dystopian sci-fi novel is neither lacking in imagination nor scope. Do you have the nerves to follow this terrifying tale to its epic finale? Her life story is not particularly fascinating, but her love of technology, PC games and writing is. Beside writing, she spends her time slaying rendered baddies in the form of robots, gangsters and aliens – with any weapon that happens to be at hand. Ronel has published her first science-fiction book, Compile:Quest. 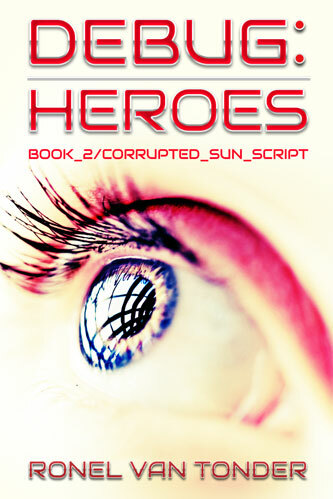 She’s currently hard at work creating the second book in the Corrupted SUN Script trilogy. When she’s not writing, she’s gaming, and when she’s not gaming she’s either sleeping or eating, as these are prerequisites for a continued life on planet Earth. This entry was posted in Cover Reveal and tagged Debug: Heroes, Ronel van Tonder on January 23, 2015 by photocosmic.